What will customers want in the future? They will demand a wider range of variants and more personalized products. Thus, future production must be able to adapt quickly to changed market requirements. Industry 4.0 is the answer to this challenge. Our i4.0 software solutions link all the components of your value stream with each other and the people involved. What we want to achieve: full-grade connectivity, complete transparency, and reduced complexity. We connect machines and whole manufacturing lines to value-creation networks. With our solutions you can achieve complete transparency and coordination of all logistics operations in and outside your factory. Bosch offers a wide range of services and consulting in the field of Industry 4.0, including collaborative projects to test new business models. We’ll help you discover new potentials along your value stream. Components, modules, and systems for the optimal integration of the solutions of machine manufacturers into vertically and horizontally networked Industry 4.0 environments. 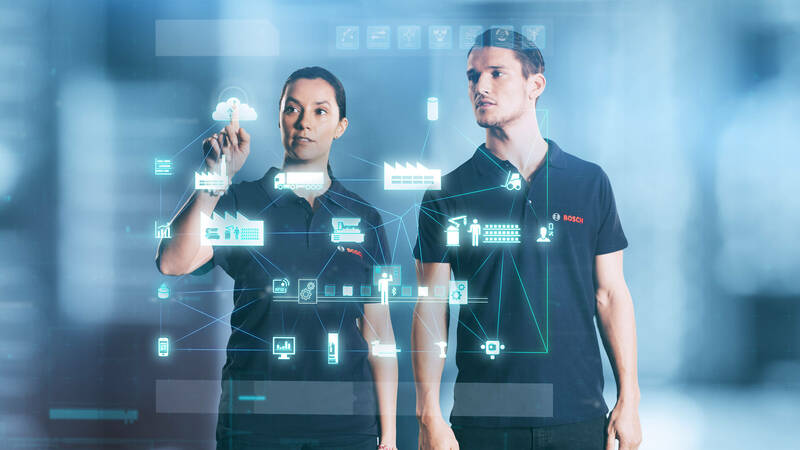 Bosch already has all the relevant enablers for Industry 4.0 in its portfolio and offers a wide range of hardware and software solutions. Rethinking automation: efficiency for machine manufacturers and operators .Realize your machine projects purposefully and efficiently. Seamless, innovative and future-proof software system for all mechanical engineering phases and the entire machine lifecycle: from project planning, control programming and visualization through motion control, safety, simulation, start-up, connectivity and diagnosis to comprehensive services for manufacturing machines and systems. The Nexeed Production Performance Manager is the Industry 4.0 software solution for systematic production improvement. The Nexeed Production Performance Manager harmonizes various pieces of production data. The software can extract customized information from this data and apply production knowledge automatically. The processed information is made available to the user directly for specific purposes. Consequently, response times can be shortened, faults can be prevented, tasks can be clearly assigned and newly acquired information can be constantly accessible. Once the sensors have been attached to the machine, the retrofit solution provides fast information about unwanted delays, bottlenecks or the status of the machine using a Bosch Rexroth IoT gateway and a user interface optimized for the customer. This way, the sources of faults can be identified and remedied faster and an increase in OEE or efficiency can be achieved. The intelligent logistics 4.0 solution for the digitization of the material flow from the supplier to the customer’s incoming goods point. Nexeed Track and Trace enables shipments and assets to record a “digital travel diary”: products and load carriers not only update the individual stops, but also regularly communicate their location and status to the cloud. For instance, schedulers can view at any time where the packages are and whether they are expected to arrive on time. In addition, information about temperature, vibration and humidity can also be transmitted. Nexeed Intralogistics Execution provides transparency regarding the path of the material, starting with its removal from storage to the point of use in production in real-time. Our vision comprises a digital, smart material flow throughout the entire intralogistics value stream. Interoperable modules deal with the three most prevalent issues for logistics specialists: digitizing the vehicle fleet, optimizing material storage and designing transport routes dynamically. They help the logistician in his daily work and facilitate long-term planning. With Nexeed Intralogistics Execution, information about the entire fleet is available in real time: from material storage, to the exact position of vehicles and transport routes, through to the percentage of empty and loaded trips. This solution supports logistics specialists in the dynamic planning and execution of all in-house transport movements. The warehouse arrangements can be optimized using real-time inventory data from the intelligent supermarket. The Energy Platform by Bosch provides a comprehensive overview of energy consumption and costs. Energy costs are a major factor in manufacturing enterprises. The Energy Platform provides a full breakdown of energy consumption and costs — for the whole facility or individual machines. The modules of the platform can be perfectly tailored to your requirements and used to record, visualize, and control the energy consumption of your overall production. The IoT Gateway enables a simple exchange of data between existing and new production machines with IT applications. Network new and existing machines cost efficiently and optimize production processes and product quality: The IoT Gateway makes it easy to connect to Industry 4.0 environments without intervening in the automation logic. The precisely coordinated combination of control hardware and software collects sensor and process data and enables process data analysis. Rexroth CytroPac is a compact and energy-efficient standard power unit. Space-saving design, completely equipped, and integrated. Radically new design due to a new technical approach with heat pipes for integration into all machine designs. The TDL brings transparency to supply chains. Parameters such as temperature, humidity, shock, and tilt are recorded and visualized. The TDL is the cost-effective, simple, all-purpose, and reliable way to bring transparency to the entire supply chain, with the usual Bosch quality. Since the limits of each recorded parameter can be individually configured, any transgression of these limits is traceable and clearly assignable throughout the entire supply chain — which gives you a good sense of transparency and control. The XDK enables professional users and developers to directly create applications for the internet of things (IoT). The Cross Domain Development Kit XDK 110 is a wireless sensor device that enables rapid prototyping of sensor based products and applications for the internet of things (IoT). With state of the art sensor technology and ready-to-use software packages it enables you to immediately start an internet of things application. CISS is a multiple sensor solution that increases your production efficiency and saves costs by monitoring data and enabling predictive maintenance. The Connected Industrial Sensor Solution (CISS) is a flexible sensor solution specialized for your rough industrial environment. CISS offers you an easy handling of the complete machine range through a single multi-sensor device. Therefore, you increase your manufacturing efficiency by monitoring your machines, processes, and environmental conditions. Drawing from our long experience we found seven key features of i4.0. They are the guidelines for all new components, software modules, and services by Bosch. From autonomous rollers to flexible manufacturing modules: with distributed intelligence, modules know their technical skills and organize themselves decentrally. Fast Integration and flexible configuration facilitate the adaptability of Industry 4.0. People, machines, processes, and flows of goods are connected easily and fast and can be quickly adapted to ever-changing requirements. Open Standards are essential to integrating equipment and software of various suppliers into connected concepts. They form the basis for horizontal and vertical integration and thus the seamless exchange of information. Virtual real-time representations of objects interact with each other and with software systems. They enable the real-time analysis of all manufacturing and logistics data and the control of all physical objects. Aggregating and analyzing all the available data during the complete lifespan of a product helps to continuously improve the design and manufacturing processes. Safety and security for Industry 4.0 includes the protection of people from machinery-related hazards (safety) and the protection of corporate facilities and IT from attacks and faults from the surrounding environment (security). In Industry 4.0, people are the key players — work is getting easier, safer and more efficient — enabled through technology — but machines will continue to play the subordinate role. Industry 4.0 up close — embark on a guided tour through one of our Bosch plants and learn about our products and solutions in practice. Experience Industry 4.0 in the field in one of our five selected plants: Reutlingen, Feuerbach, Suzhou, Homburg, and Blaichach.